What is the nature of space and time? How do we fit within the universe? How does the universe fit within us? There's no better guide through these mind-expanding questions than acclaimed astrophysicist and bestselling author Neil deGrasse Tyson.But today, few of us have time to contemplate the cosmos. So Tyson brings the universe down to Earth succinctly and clearly, with sparkling wit, in digestible chapters consumable anytime and anywhere in your busy day.While waiting for your morning coffee to brew, or while waiting for the bus, the train, or the plane to arrive, Astrophysics for People in a Hurry will reveal just what you need to be fluent and ready for the next cosmic headlines: from the Big Bang to black holes, from quarks to quantum mechanics, and from the search for planets to the search for life in the universe. 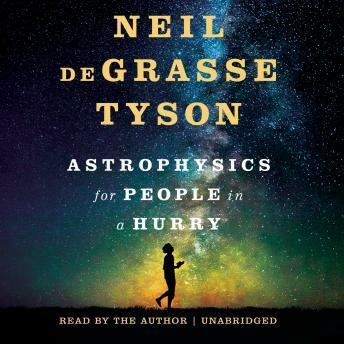 I actually thought it was an excellent book but way too short to explain what Astrophysics is all about. Narration was excellent. To go through such intense information, 10 chapters lasting a total of three hours is just too brief. I truly enjoy NDT but this could have easily been another 10 hours of explaining what it was he was talking about. I did enjoy though! So much info in such a short amount of time. Mind blowing wouldn’t be a phrase that does it justice!!! This is a book I will listen to more than once. You can learn something new every time you hear it. Loved the book but just like a sllice if the best chovolate cake yoy have ever had, it leaves u wanting for more. Carl Sagan and Neil De Grasse Tyson two of my favorites. NDT for President!!!! Great book for a beginner, he does a great job of adding perspective. Fascinating read. Could have done without a few unnecessary curse words (that's the reason for the 4 stars) but other than that a fantastic book. This information really supports my belief in a Creator. Loved the narration, really great book, loved the idea that life could’ve started on mars then seeded on earth, loved the ego diminishing part at the end. Not my usual reading, but absolutely worthy of stepping out of my comfort zone.